The second installment of pic of the month (POTM) is here! Calm down, calm down, I know it’s exciting. Contrary to what you may all be thinking (and some even hoping), it’s a PICTURE of the month and not some priceless emerald from deep down in the cavernous netherworld of a nostril! Now that that’s clear and we can breathe easy(er), we can move on to this months image! The image is relevant for this month because the USA recently qualified for the final round of World Cup Qualifying off of a two goal performance by the man featured here. Also, it’s an image that fully exemplifies the “head first” motto that we got going on this blog. Lastly, it’s fitting because it’s an image of a man considered to be one of the best Americans to ever play the game in England, which is of course the current environment for my football endeavors. You have just scored two goals against Guatemala in World Cup Qualifying to ensure that the USA move on to the next stage, one step closer to the World Cup 2014 in Brazil. What do you do? Well, of course, grab the nearest giant head of yourself making an angry face and parade around the field for all to see! Pretty sweet. Props to the guy who made this sign. I would say that you have probably made it on the big stage when random people make giant signs of your ugly mug because they love you. 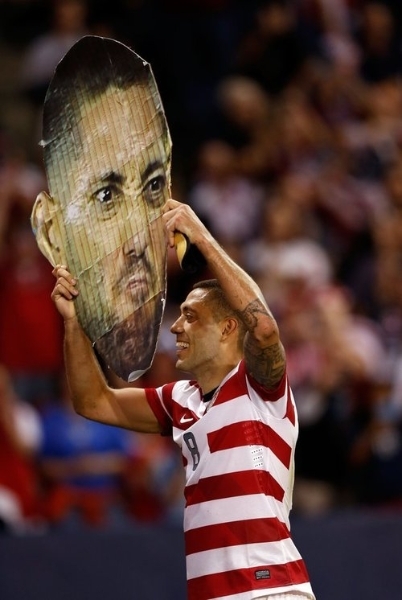 Let’s face it, if you’re an American soccer fan, you love Clint Dempsey. I do. Now, I’m sure some people have plenty of not so nice things to say about him. Yet, when his haters taunt him and tell him he’s too arrogant, too cocky and won’t be able to fit his big-head through the door, he can smile and say: “you’re absolutely right!”. Go USA – Don’t tread on me. Take care and don’t be afraid to dive-in head first (cause if you mess one up now you’ve got another one). PS: If you missed the last Pic of the month (POTM), see it here!